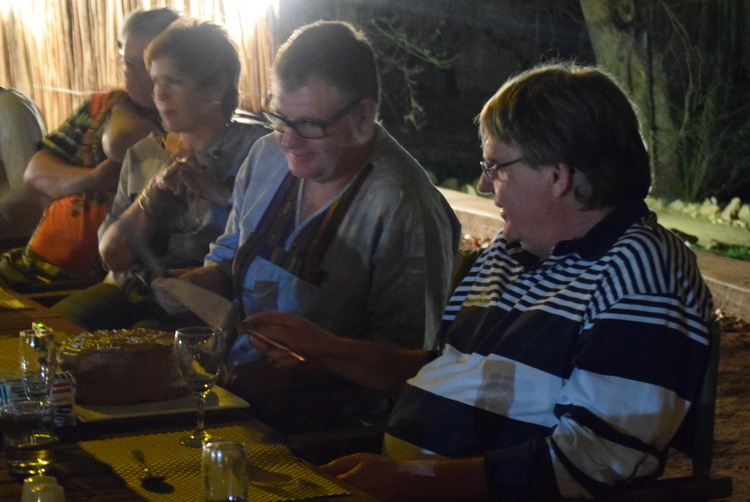 No better excuse than a twin 60th birthday to gather with friends and family in the African bush. 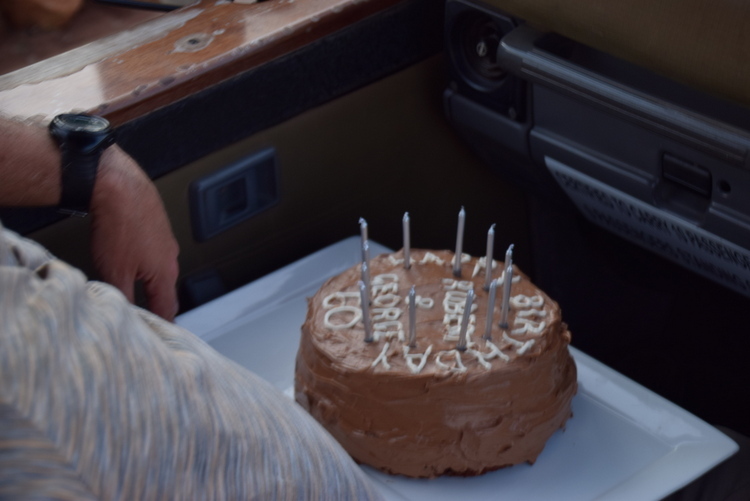 The birthday party itself was planned to be a low-effort affair, with the lodge down the river doing all the hard work – but first there was this small matter of a birthday cake. Lindsay had come prepared with cake tins, chocolate, ground almonds and baking paper, and the famous Annabel Langbein gluten free chocolate cake recipe. I have to say I was more than a little sceptical of the undertaking – making two cakes simultaneously, with a recipe relying on the beaten egg whites for “rise”, in a completely unknown oven that had proven itself to be more than a little temperamental in the preceding days! But a grand team effort from the “ladies in the kitchen” – Lindsay, Caroline and me” delivered a fantastic result. Dr Google came to the rescue next day with a recipe for butter icing that didn’t require icing sugar (the forgotten ingredient) and there you have it – a two tier birthday cake fit for the occasion! 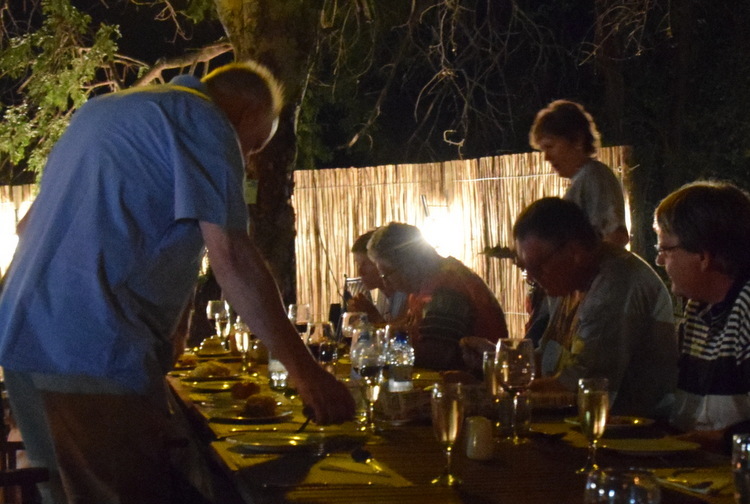 The rest of the party (another 10 to match our already settled 10) started arriving before lunch on the day of the birthday – fortunately lots of vegetarian leftovers in the fridge – and then retired to the lodge where they were staying for an afternoon nap before the real party began. So very much enjoyed seeing people from this and other parts of the world that were part of our youth – some not seen for 30 years or more! 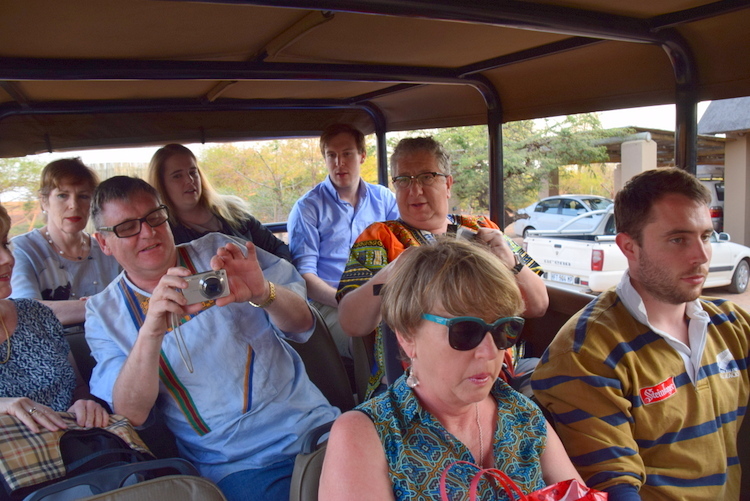 With the added bonus of also seeing many of the missing cousins… My goodness, if only I could get them all to NZ, family dinners would be spectacular! Well, more spectacular than they already are, of course. Philippa, Robert, Jessica and Sarah, you were sadly missed. But very cool to see Catherine, Adrian and James together in one place, and to meet Max and Charli and their respective partners. Although there were no speeches planned – just some “thanks for comings” from birthday boys Robert and George – Robert did then, in true kiwi style “open the floor” to everyone else, encouraging those who wanted to say something to speak. More than a few took up the opportunity (yes, cannot tell a lie, including me). Prize for best speech of the night, however, goes to Charli’s fiancé Lee – a newcomer to the group, about to marry into the family, and probably also the guest least likely to fit in (boy, were we wrong about that!). His speech was brief, and to the point – he talked about how he too comes from a big, very close family, but they all live very close together, work together in the family business… And how this extended Jamieson family he is marrying into proves that you can still maintain really close family bonds even as you are scattered on the four winds to the very corners of the earth. A thought worth remembering, and one which sums us up so very well. Dinner included such old favourites as peri peri chicken livers, pap and works, with tomato onion gravy, and of course lots and lots of braaivleis! 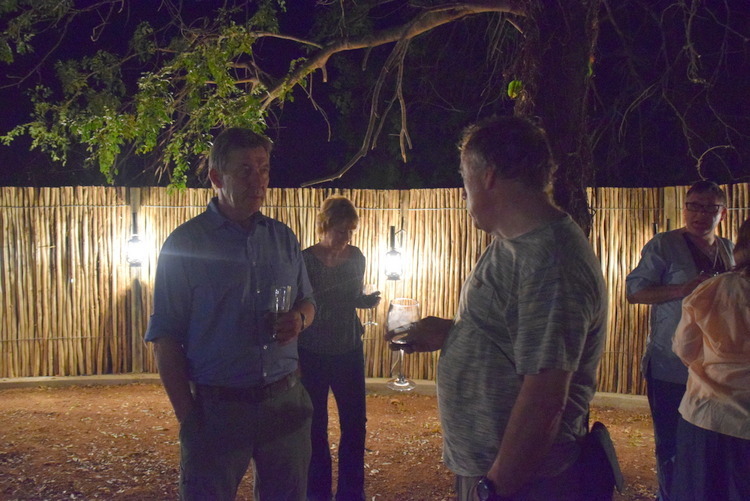 Much red wine was drunk, tales of our youth revisited… Thank goodness for Johan our trusty ranger waiting to drive us back to our own house down the river – a short but circuitous bumpy dirt track, populated by wildlife including a herd of kudu eating the aloes in the neighbour’s garden! Never intended to be a one trick pony, the birthday celebrations continued the next day at our house, with much wallowing in the pool, and yet more food, glorious food, after an emergency supplies dash into the supermarket in Komatipoort when it became clear we would not be able to stretch our supplies far enough – loaves and fishes came to mind. Thank heavens for Sonta, our lovely housemaid, who unflappably dealt with the continuous stream of dirty dishes and glasses, returning them to the counter only to find them in immediate use again. 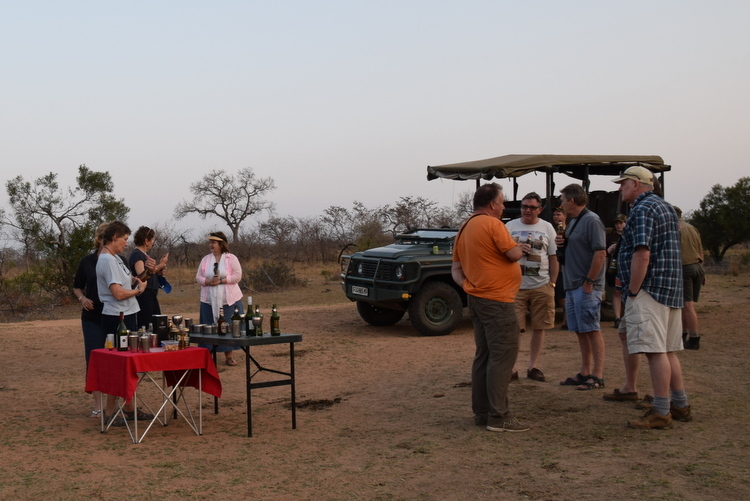 And then there was time for one last evening game drive with everyone – two vehicles going their separate ways, but meeting up for sundowners at the hippo pool, and the final farewells to the birthday visitors, before the rest of us retired back to our slothful ways for a few more days. 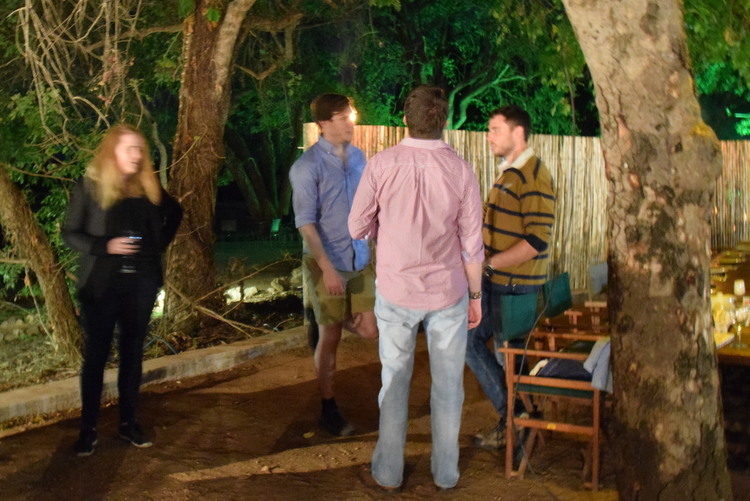 As I surveyed the gathering, I couldn’t help but reflect on how un-South-African I feel. 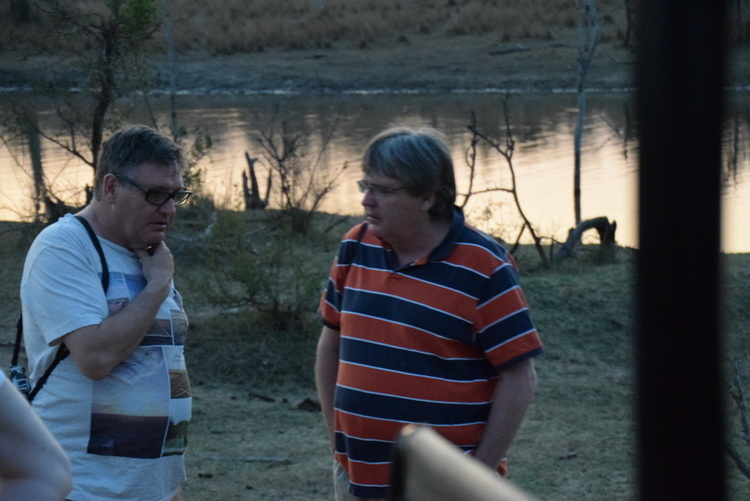 Somehow, others -despite having been away for decades – have maintained that easy connection, that common ground, visibly reflected in the way that many gatherings (this one included) break up into the men’s group and the women’s group (even when there is not an obvious reason like men braai’ing the meat and women making the salad. As I stood to one side, with some of the next generation, I realised that I didn’t fit in either group, but that that was not really the point. Fit it seems, is more about what’s in your heart than what’s on your birth certificate, and the words of my mother rang in my head “South African by birth, Kiwi by choice”. 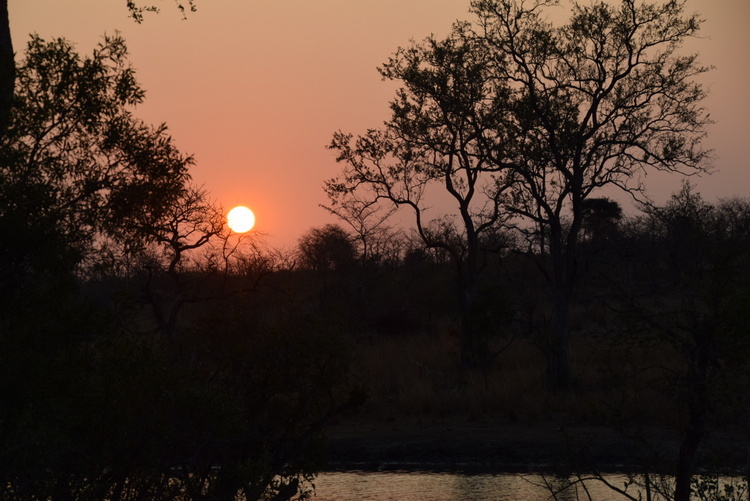 Lovely blog Debra, going to share it on ours.